The Pike Cichlid is a favorite, enthusiasts exclaim "they are honestly the coolest looking fish"! The Pike Cichlid Crenicichla lepidota is a handsome torpedo shaped fish. It looks great and adds a nice touch of variety to an aquarium. Though they aren't a very large cichlid and only reach about 7" (18 cm), they are aggressive and voracious predators and not suitable for community tanks. These cichlids are known in the aquarium hobby as one of the most interesting and unique fish and tend to inspire only two emotions in hobbyists: either obssesive love, or complete indifference. The Pike Cichlid comes from a family of cichlids collectively termed the "pike cichlids", though the Pike Cichlid itself is the best known. All the members of this family share an elongated body shape and attractive patterning, though they vary widely in terms of coloring and size. The Pike Cichlid displays a dark line running across its body, above which is a light greenish yellow and below a more silver or beige color, though depending on where the fish originated from, some Pike Cichlids will have a blue-gray body. The eyes are red and there can be accents of blue and red on the fins. The notable pattern features that distinguish this pike cichlid are its spots. There are 8 - 9 small spots edging the top of the dark mid-body line. These spots will extend upward into bands when the fish is excited and recede when its calm. There are also two bigger spots on the line that are accented with reflective scales. The first is a large shoulder spot that actually interrupts the horizontal line. The other is a smaller gold-framed spot found on the males that is integrated into the line on the base of the tail. These features have led to two other common names for this fish, the Two Spot Pike Cichlid and the Comb Pike Cichlid. While an intelligent and engaging fish, the Pike Cichlid is also extremely aggressive and territorial. It will eat any fish smaller than itself and will harrass and eventually kill most similarly sized tankmates. Like other cichlids this fish will get to know its owner and will readily engage in playful behavior such as begging for food, dashing around for attention, and even showing off. But, again, it is not a community fish and should not be kept with any tankmate that cannot adequately defend itself. Given their aggressive nature, Pike Cichlids are best kept in their own tank unless the tank is very large. If you are interested in keeping your Pike Cichlid with tankmates, large South American cichlids, scavengers, and other large species such as Silver Dollars and Tinfoil Barbs can be kept as tank mates if there is plenty of room. That being said, be sure that your tankmates are not so aggressive as to kill your Pike Cichlid. Finding a correctly balanced aquarium may take some time and experimentation. They are moderately difficult to care for since they need to be in a larger tank with appropriate tank mates they cannot eat. They need plenty of places to hide when young or they might experience large amounts of stress and succumb to stress related diseases. As they get older, they will happily stay out in the open. Provide rocks and wood with plenty of nooks and crannies, along with lots of vegetation. They are quite adaptable and don't require special water chemistry, but they should not be kept in excessivly hard water (up to 12° dH will do perfectly). That being said, they do require their tank to be kept very clean, which can require weekly water changes of up to 50%. One last note, be sure to provide their aquarium with a lid or a cover. They are known to jump excitedly out of their tank either when stressed, anticipating food, or just bored. Watch a Pike Cichlid feed! 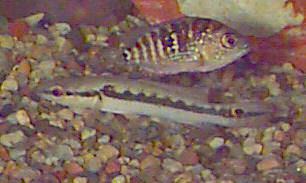 A large Pike Cichlid and a catfish are being fed in a beautiful and well kept tank. Lots of great views of the Pike Cichlid and you can see how voraciously it eats and see why it might be a messy eater! The Pike Cichlid Crenicichla lepidota was described by Heckel in 1840. Other common names it is known by are Two-Spot Pike Cichlid and Comb Pike Cichlid. They are found in Paraguay drainage from Brazil to Argentina and on the Rio Grande do Sul coast of Brazil. They are found in the middle and lower parts of the Uruguay River in the parts that run through Brazil and Uruguay. They are also found in the Amazon River basin in the Guarpore River drainage in Bolivia and Brazil. Within these waters it likes to play the predatorial stalker role. Much of its day and hunting time is spent waiting under ledges, rocks, and amongst vegetation waiting from prey such as smaller fishes, worms, and insects to wander by before snapping them up. The Pike Cichlid is listed on the IUCN Red List as Least Concern (LC) due to a lack of threats. It has a very wide distribution and is very resilient to habitat modification, and so is unaffected by many of the changes currently occuring in the rivers of South America. Although it is collected for the pet trade it is not at a level of concern. IUCN Red List: LC - Least Concern - Very stable population. The Pike Cichlid is an elongated, torpedo shaped fish. They are moderately sized and reach about 7 inches (18 cm) in length and live for about 10 years with proper care. There is a horizontal line that runs the length of the body from the mouth all the way to the end tip of the tail fin. Above the line is a series of 8 - 9 speckled splotches on a light olive-green to yellow background while below the line is a silver or beige color. They can have accents of blue and red in the fin and in the speckles above the stripe. The eyes are red. In addition, there are several different color morphs depending on the location where they are collected, some have a blue gray coloring. The splotchy feature on the horizontal line has led to the common name Comb Pike Cichlid. These splotches will extend upward into bands when the fish is excited or stressed and recede back inot spots when the fish calms down. These cichlids are also distinguished by two black spots. One is a black spot accented with reflective scales in the area just behind their gills. The second spot, only present on males, is a dark, gold-framed and located at the base of the tail. This feature has led to the common name Two Spot Pike Cichlid. The Pike Cichlid is a moderately difficult to care for fish and is best kept by an experienced aquarist. Though it's not an exceptionally large fish (only reaching about 7 inches or 18 cm), it is an aggressively predatory fish and will kill or eat any fish of a similar or smaller size than itself. They require a good sized take and feed mainly on live foods. They are a hardy fish and can adapt to a wide variety of water conditions, but due to their diet of mostly live fish and their own temperment, they require a diligently maintained cleaning schedule of at least 50% water change every week. The Pike Cichlid is a carnivore that likes to be fed live fish. They can be fed feeder goldfish as adults and when smaller will eat Rosy Reds, Guppies, White Clouds and blackworms. They can be persuaded to eat cut up fish, shrimp, and pellets if they are kept with other pellet eating fish such as large South American Cichlids. Feed once to twice a day depending on age. All fish benefit from vitamins and supplements added to their foods. When feeding mass produced feeder fish make sure to quarantine them for a week before feeding and treat for parasites. Never introduce water from feeder tank into the Pike Cichlid's tank! Feed warm blooded mammal meats (e.g. red meat, beef heart, chicken, etc) only as an occasional treat. Flake Food: Occasionally - When young they can be trained to take them. These fish require very clean and clear water, a fact which is complicated by their eating habits. Since they mostly eat live foods, they tend to be extremely messy and routinely create an unclean tank. You should have strong and effcient filtration, likely from a cannister filter, and will need to diligently clean the tank and change the water. Take great care in removing all decaying foods from the tank substrate. You will need to have a fairly large tank for a Pike Cichlid, at least 30 gallons or more, and a significanlty larger tank (100 gallons or more) if you want to keep one with other fish. They do fine with moderate water movement and strong efficient filtration. They are quite adaptable and don't require special water chemistry, though they prefer softer water (up to 12° dH). They need plenty of places to hide when young or they might become overly stressed and can succumb to disease. As they get older, they will happily stay out in the open. Provide rocks and wood with plenty of nooks and crannies along with lots of vegetation, and more subdued lighting. Floating plants are a great option to make the young fish feel sheltered and at the same time out in the open for viewing. Cover the aquarium at all times as these fish like to jump. Minimum Tank Size: 30 gal (114 L) - 30 gallon for a single fish and 100 or more for a pair. The Two-Spot Pike Cichlid is not a community fish and will eat any fish that is smaller than they are. They will even try to eat other fish that are the same size. They are extremely territorial and aggressive towards their own kind as well. They will kill each other even as juveniles. Make sure the tank is very large with individual hiding places for each fish if you try to keep a pair. They will attack whatever fish happens to be in the tank with them if the tank under 40 gallons. If you want to put them with other fish make sure you have a very large tank and tank mates that are much larger. Some large Central and South American cichlids you can put with them are Cuban Cichlid Nandopsis tetracanthus, Regan's Cichlid Vieja regani, Pastel cichlid Amphilophus alfari, Tailbar cichlid Paraneetroplus hartwegi, Loiselle's Cichlid Parachromis loisellei, Steindachner's Cichlid C. steindachneri, Red Breast Cichlid Amphilophus longimanus and Amphilophus rostratus. Scavengers and other large species such as Silver dollars and Tinfoil Barbs can also be kept as tank mates if there is plenty of room. Same species - conspecifics: Sometimes - Needs a very large tank. Large Semi-Aggressive (): Monitor - Will attack anything their size or smaller. The male is larger and will have a darker olive-green coloration with shiny scales surrounding the spotting along its back, no white in the dorsal fin, and larger more elongated fins. The smaller female has more of a metallic sheen along with a black and white patterning in the dorsal fin, and the belly can be a light red to orange. The Two-Spot Pike Cichlid has been bred in captivity. The best way to obtain a mated pair is to house 6 or more juveniles together for a few months and let them pair up naturally. As they are sexually dichromatic you can determine a male and female by their markings and color as they begin to mature. The females reach maturity at 5.5" and the males at 7". The pair will need very clean water and need to be conditioned to spawn. Provide rich protein foods and an environment with a pH of about 6 and the temperature at about 79° F (26° C). Their courting can be very violent and is initiated by the female scoping out a territory with a potential spawn site. It is best to remove other fish once the Pike Cichlids start spawning. They will dig out a pit under a roomy cave or piece of wood, spawning on the ceiling of the enclosure. The eggs are oval and whitish, and will hatch in 4 to 5 days depending on the temperature, 75 - 82 ° F (24 - 28 ° C). The female will care for the brood while the male defends the territory until the fry become free swimming, at which point the male takes the responsibility of raising the young. See more about cichlid breeding here: Breeding Freshwater Fish: Cichlids. The Pike Cichlids are susceptible to typical fish ailments, especially if water is stale and of poor quality and oxygenation. They tend to be susceptible to illness when stressed, usually caused by not providing ample hiding places. One common problem is Ich. It can be treated with the elevation of the tank temperature to 86° F (30° C) for 3 days. If that does not cure the Ich, then the fish needs to be treated with copper (remove any water conditioners). Several copper based fish medications are available for Ich. Copper use must be kept within the proper levels, so be sure to follow the manufacturers suggestions. A copper test also can be used to keep the proper levels. You can also combine increasing the temperature with an Ich medication treatment. Intestinal disease can be treated with metronidazol. As with most fish the Two-Spot Pike Cichlids are prone to skin flukes and other parasitic infestations (protozoa, worms, etc. ), fungal infections, and bacterial infections. It is recommended to read up on the common tank diseases. Knowing the signs and catching and treating them early makes a huge difference. For information about freshwater fish diseases and illnesses, see Aquarium Fish Diseases and Treatments. The Pike Cichlid, also called Two-Spot Pike Cichlid or Comb Pike Cichlid, is only sometimes available in fish stores, but is generally found online. They are moderately priced for juveniles but more for an 5 to 7 inch adult. Man, I've got an african chiclid and it kills everything I put in my tank. That is pretty typical of many fish. Most cichlids will do that!